Tainan – The Ugly Duckling? I went to visit our office in Taiwan last week. On Friday, I took the HSR train and went from Taichung down south to Taiwan’s oldest city – Tainan. The city has always been on my list of places to go since I first set foot on Taiwan three years ago. But somehow I was never able to make it down south. I was always stuck in Taipei. This time, though, I made it. And boy was I in for a disappointment. Tainan is praised in the Lonely Planet as the “City of Temples” in Taiwan. It’s the oldest city, albeit a mere 350 years, but it should have much more to offer in terms of history and architecture then, say, Taipei. Unfortunately it doesn’t live up to its expectations. I left the Tainan train station and walked to the hotel two blocks away. I immediately became aware of the drawbacks of working for a Product Design company. That is, you care about ‘design’ in all aspects. In this case I came to realise the architectural sins around the train station. All buildings were just grey, ugly, concrete boxes. Dreadful! I was reminded of the industrial cities in Germany that are equally ugly. I don’t know why, but wherever you go in this world, whatever has been built in the 60s or 70s is remarkably ugly. So ugly indeed that it can only be improved by a few tons of dynamite. “Oh well”, I thought. It can’t be that bad. After all, Hong Kong isn’t a beauty either, apart from Central and a few spots. So let’s give Tainan a chance. It has to have some nice spots. And it does. Our first stop on the next day was “Anping District”. You’ll find an old fortress used by the Dutch when Taiwan was a Dutch colony in the 17th century. I was also glad to see that where China is charging ridculous amounts of entrance fees to foreigners, Taiwan keeps to NTD 50 (around 1.20 Euro or USD 1.50) for it’s attractions. The fortress wasn’t too bad, but nothing very spectacular for Taiwan’s oldest city. I expected a bit more. In fact, the most interesting attraction to me was the “Tree House”. It’s an old stone building that was left empty many years ago. Nature took care of it, now trees are growing inside and outside the house. The walls are penetrated by thick branches, the roof is a canopy of leaves. It’s remarkable. And stunningly beautiful, so unlike the rest of the city. Apart from that, Anping didn’t have much to offer. There’s a market with street food. But nothing compared to Taipei, not even close. So we went back to our hotel. The next day was spent on the “Lonely Planet Temple Tour”. We made it to almost all temples on the list, starting from the brilliant “Confucius Temple” down to the “God of War Temple” and the Chikah Towers. 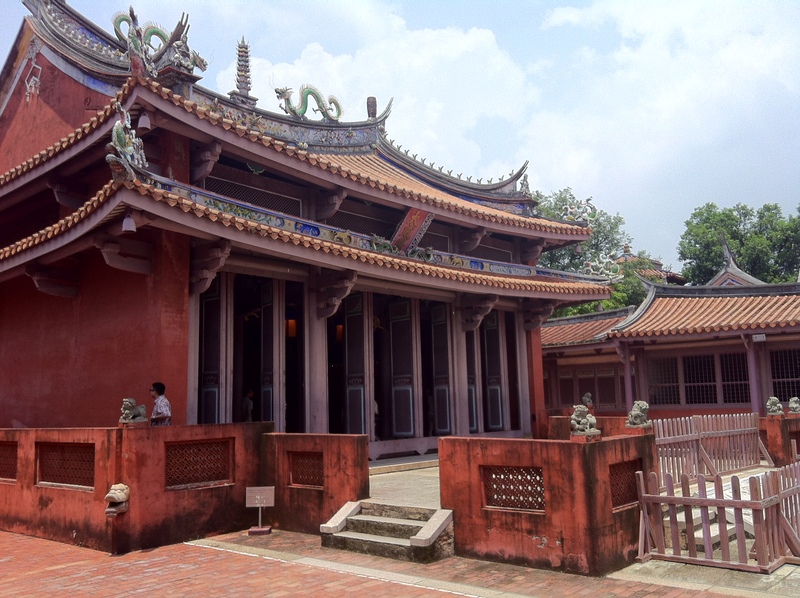 If you like temples, Tainan is your city. The Confucius Temple, God of War Temple and the Chikah Towers are really worth a visit, don’t miss out on them. Other temples are so-so. If you’re a temple fanatic – go for it. Otherwise get a Bubble Tea and relax. So is Tainan worth a visit at all? Is it indeed “The Ugly Duckling” as I named this post? If you intend to spend two or three weeks in Taiwan and tour the island, Tainan is certainly worth a one day stop. But not more (unless you’re a temple maniac). I’d rather spend the time in Taipei, Alishan or Sun Moon Lake. If you only have a few days or one week, visit Taipei and enjoy some nature in Central Taiwan. To me, Tainan is an ugly duckling. It has so much more potential to become a first-rate tourist destination. The only thing needed is dynamite, paint and, most important, money! A refurbished (or better: new) train station would start lifting the image. Get rid of the ugly concrete blogs around the train station. If that can’t be done, build up a fake facade so it looks nicer. Make sure there are signs for all tourist attractions in English and Chinese. Provide English translation at all tourist locations. I was surprised that most tourist places only had Chinese language information. Ask some street food vendors from Taipei to relocate to Tainan to get in some decent food. Maybe take the city of Guangzhou as an example. A decade ago it was an ugly factory town. It’s colonial past was rotting away on Shamian island. Before the 2010 Asian Games, the whole city was renovated including the now splendid Shamian island. Tainan could use a bit of the same. It’s an ugly duckling, but can become a white swan. If only the persons in charge would want it to. Parking in Hong Kong – Where shalt I park thou my lovely motorbike? Well what you wrote about Tainan is equally applicable to any Taiwanese city… Grey and dreadful.